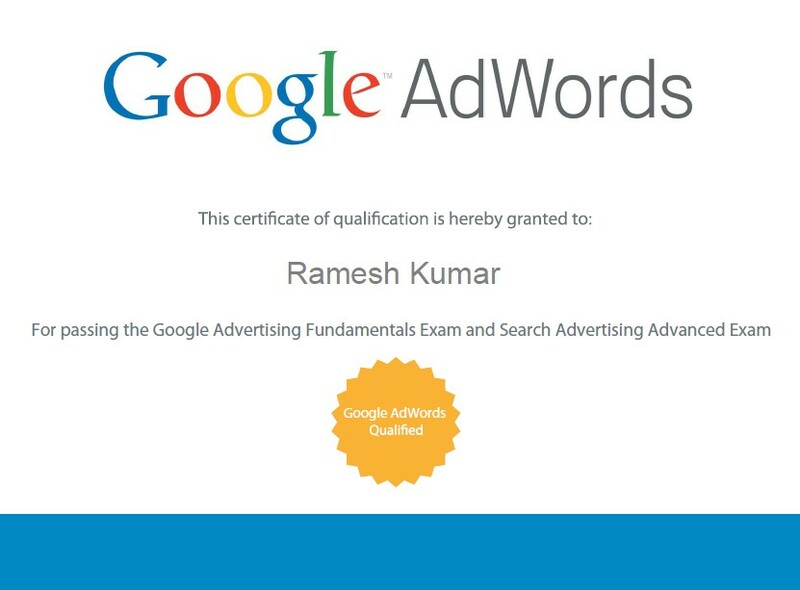 We have designed the 'Google Adwords Certification Program’ to empower professionals and entrepreneurs to reach their digital marketing goals. Our Project based teaching methodology covers both the strategy and implementation techniques which help you develop tangible skills. Understand how Pay-Per-Click Advertising works. Learn how to strategize, create, and optimize Google AdWords campaigns. We have 1 upcoming online course(s). Google Adwords Certification Program is perfect for anybody required in the implementation, planning or estimation of digital systems – or any individual who might want to seek after a career around there. The program is good for all expert of all levels and disciplines and will set you up to take up a more specialist part inside the general marketing area. Advertising and Marketing Professionals who need to learn/understand Digital Marketing and to help them get the best out of their Digital channels. Digital Marketers who need to track their profession and intensify their space information. Little and Medium (Entrepreneurs) who need to boost online channels for developing their business. Innovation/IT Professionals who are customer confronting and are required to pitch Digital Marketing Solutions to their clients. Taxpayer supported organization Professionals or Ministries who need to be fully informed regarding the changing patterns and shape methodologies tuned in to changing times. Students who need to upskill in Digital Marketing to investigate an extensive variety of profession openings. 1. What are the Training Methods/style? We utilize world's best internet preparing software to conduct brilliant online instructor driven training. This alternative is perfect for caught up with working entrepreneurs/professionals situated in any part of the world. The primary factor being a reliable internet connection. This serious and connecting with preparing philosophy for google adwords is custom fitted to the necessities of working professionals/business people. We can convey our Certification Program in Google Adwords to your business and lead it to the skills and related knowledge of your staff. You pick the date, time and modules to be prepared on. 2. How would I select? 3. At the point when is the end date for applications? We would require the appropriately finished application frame and course charge before the course beginning dates. EMI Options from HDFC, Citibank, Axis, ICICI and so forth. 5. Will I get Google (GCP) Certified after finishing this course? To be a GCP (Google’s Certified Professional), you should endeavor and pass the highly rated GCP Exam. There are three Exams out of which you need to pass two exams to be given the GCP certificate. This exam is administered online by Google. Digital Academy will assist you in getting ready for the examination. When you pass the exam, the certificate would be issued online quickly. 6. Do you give any placement support? Digital Academy is known for its quality project and training based instructing approach. We often get messages from our industry companions searching for prepared assets for their business. While we unquestionably suggest our students for great job offers we see. 7. Will I be given any Live Project to deal with? Yes, we take after a one of a kind training strategy wherein we urge students to apply all that they learn in their preferred class on a live project. We also utilize practical exhibitions and industry best practices contextual investigations in our training. 8. What is all incorporated into this google adwords course charge? The course expense involves 70 Hours (20 weeks) of instructor-drove training and an entrance to all course materials and assets for further information upgrade. - Lifetime Membership, a chance to take part in Networking Events and industry discussions.